New Content Added 9/4/2010 - During the run of Mystery Science Theater 3000, Best Brains held two Conventio-cons as well as the 1992 Live Show. Cast members also regularly popped up at coventions across America, and they continue to to do so today. While I was not a fan in the early days, in 2000, I had the great fortune of attending Gateway Scifi Media Con in St. Louis, Missouri, which featured Mike, Kevin, Bill, and Mary Jo. The following year, my friend Joey attended Gateway 2001, with guests Trace Beaulieu and Frank Conniff, and Joey graciously agreed to cover the event. Fast forward a few years, and Mike Nelson appeared only a few hours from where I call home, at Guilford College, in North Carolina, at What-The-Hell?! Con 2005. Two accounts of that con are presented here, mine, and fellow mstie Dustin McNeill's. Moving on to 2008, and Joel starts touring the country with Cinematic Titanic. I was able to catch a live riffing in St. Louis of Santa Claus Conquers The Martians. Enjoy the con logs, pictures, transcripts, video clips, and magazine articles! Cinematic Titanic Live! - Host to Joel Hodgson, Trace Beaulieu, Frank Conniff, Mary Jo Pehl, Josh Weinstein. At Family Arena, St. Louis, Missouri. November 1, 2008. Covered by Jeff Zehnder. What-The-Hell?! Con 2005 (Report #2) - Host to Michael J. Nelson. At Guilford College, in Greensboro, North Carolina. January 14-16, 2005. Covered by Dustin McNeill. What-The-Hell?! Con 2005 - Host to Michael J. Nelson. At Guilford College, in Greensboro, North Carolina. January 14-16, 2005. Covered by Jeff Zehnder. Full transcript enclosed. Gateway 2001 - Host to Trace Beaulieu and Frank Conniff (with a special appearance by Beez McKeever.) At the Airport Hilton in St. Louis, Missouri. July 6-8, 2001. Covered by Joey Riley. 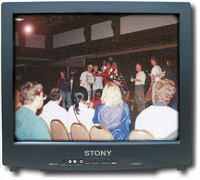 Gateway 2000 - Host to Michael J. Nelson, Kevin Murphy, Bill Corbett, and Mary Jo Pehl. At the Henry VIII Hotel And Inn in St. Louis, Missouri. July 14-16, 2000. Covered by Jeff Zehnder. Mystery Science Theater 3000 is �89 - 2010 Best Brains Inc.
Gateway Scifi Con was produced by Mary Stadter and her wonderful crew of St. Louis cronies. No material here is meant to portray them in a negative way, in fact, we love them dearly. All Other Rights Held By Their Respective Owners. Email Jeff Zehnder, the webmaster. Email Joey Riley, Gateway 2001 page chairman. Email Dustin McNeill, What-The-Hell-Con 2005 Report #2 page chairman.